A perfect match for Color Perfectionists who can create and view their images with incredible accuracy using X-Rite Solutions and edit like a pro with Affinity Photo. 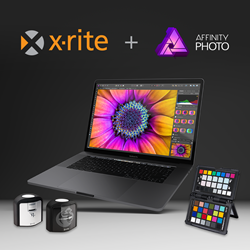 X-Rite, the leading brand of color management solutions for the photography and video markets, today announces an exclusive offer in partnership with Serif, creators of Affinity Photo. Consumers purchasing select X-Rite products will receive a free software download for macOS or Windows worth $49.99 between January 8th and March 31st, 2018. The X-Rite i1Display Pro is the ultimate choice for photographers, filmmakers and designers who are looking for the highest level of on-screen accuracy for all displays. The i1Display offers power users ‘Advanced’ user-defined settings and in-depth quality assurance tools for precise color control, as well as predefined ‘Basic’ settings to provide them with the perfect balance of speed and options to suit their individual workflow and changing needs. The i1 Photographer Kit is a convenient kit of two essential color tools, i1Display Pro and ColorChecker Passport Photo, combined to achieve fast, efficient color accuracy and control for any photo production. The X-Rite ColorChecker pocket-size targets are reference standards that professional photographers use to ensure predictable results in all lighting conditions. Not only does the ColorChecker Passport Photo speed up workflows, but it also saves time in editing. X-Rite’s ColorMunki Display solution is ideal for color perfectionists who need an easy calibrated and profiled workflow, with minimal frustration. It ensures that displays are calibrated to produce accurate color results, reducing guesswork and allowing the user more time to focus on creativity. The X-Rite ColorMunki Photographer Kit is a convenient kit of two essential color tools – the ColorMunki Display and ColorChecker Passport Photo. These two products can be combined to achieve easy color accuracy and control for any photo production. Affinity Photo redefines the boundaries for professional photo editing software. With a huge toolset specifically engineered for creative and photography professionals, whether you are editing and retouching images, or creating full-blown multi-layered compositions, it has all the power and performance you will ever need. Affinity Photo was chosen by Apple as 2015 App of the Year and received the Editor’s Choice Award. Redeem your code at http://www.affinity.store/redeem and download Affinity Photo for free. Once downloaded, Affinity Photo will be free to use with no subscription charges. The purchased X-Rite product must display the promotional box sticker and customers will have 45 days from their purchase date to submit a download request. This offer is available in the U.S. and Canada between January 8th and March 31st 2018.